EDUCATION – The latest news report as the Nigerian Senate President, Bukola Saraki, has faulted the tuition fees crisis rocking Kwara State Polytechnic, Ilorin. Although the management of the institution denied hiking the fees, concerned students had staged protests in Ilorin, alleging outrageous increments in the tuition fees. Saraki, in a statement he personally signed and made available to newsmen in Ilorin, agreed with the students position. He said information at his disposal showed an upward review of the tuition fees by the Polytechnic management. The Senate president, who appealed to the students and their parents to remain calm, assured them that Kwara State government will revisit the issue. 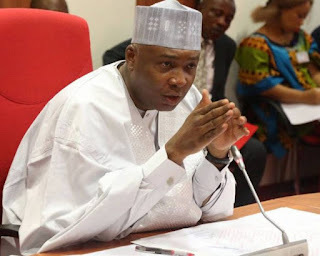 Saraki said: “Just this morning, students from my constituency sent me details of the school fees that the Registrar of the Kwara State Polytechnic released for the 2017/2018 academic session through Whatsapp. “After reviewing it, I found out there was a deliberate attempt to confuse and mislead the state government and the general public. “It is obvious that a second year student in 2017/18 is now expected to pay N20,000 more than second year students paid in the 2016/17 session. This is contrary to the claim contained in the statement released by the institution just last week. “With the present economic situation, this increment is unacceptable. I stand by my earlier position.” “.that education must be affordable for every willing citizen because it is the bedrock of development. Any increase in the school fees must be stopped now. “I appeal to all concerned students and their families to remain calm. I am sure that the government will revisit this issue.